In January 2000, the CHA, the city of Chicago and the U.S. Department of Housing and Urban Development signed a 10-year “Moving to Work” agreement to tear down and rehab their traditional family, scattered sites and senior public housing stock. The family developments in high-rises as well as low-rises would be demolished and replaced with mixed-income communities that include public and private rental units as well as for-sale housing. Residents were then uprooted and promised a right to return to replacement public housing under a Residents’ Relocation Rights agreement but construction of the mixed-income housing has stalled while relocated tenants continue to wait. 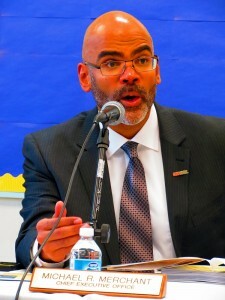 Phillip Jackson, now the founding executive director of the Black Star Project, became the first of the five CHA chiefs who have overseen the Plan so far. Former Mayor Richard M. Daley selected Jackson to run CHA in May 1999. During his one-year tenure, the 270-member CHA police force was dismantled and its duties were shifted over to the Chicago Police Department. Resident services provided directly by CHA were stopped and transitioned over to private service providers. Departments within CHA were shut down and hundreds of CHA employees were laid off (including the staff of Residents’ Journal, which spun off as an independent not-for-profit organization). Terry Peterson, a former alderman of the 17th Ward and current Chicago Transit Authority chairman, replaced Jackson in June 2000. Peterson was criticized by resident leaders, their advocates and CHA’s independent monitor for relocating former residents into other impoverished areas with high crime rates. An RJ investigation, “Deadly Moves,” confirmed that Peterson’s policies often were placing residents in risky situations. A second RJ investigation found that dozens of CHA contractors gave donations to Peterson’s former political organization despite the fact that the 17th Ward has very few public housing units. Sharon Gist Gilliam, formerly chairman of the CHA Board, became interim CHA chief when Peterson stepped down in 2006. She later resigned a year later in November 2007. In January 2008, the CHA Board hired Lewis Jordan, formerly executive director of the Housing Authority of Cook County and the Rockford Housing Authority. Jordan attempted to install policies that drug tested all CHA tenants and purge the waiting list for replacement housing. His three-year tenure came to an abrupt end in June 2011 when he felt the heat from Mayor Rahm Emanuel about his and others use of their CHA-issued credit card spending practices which were exposed by media outlets and questioned by the federal government. CHA Board member Carlos Ponce was interim CEO after Jordan’s resignation in June 2011. Charles Woodyard, former CEO of the Charlotte Housing Authority, was appointed CHA chief by Emanuel in September 2011 to replace Jordan. Woodyard called it quits in late October this year after serving only two years. This entry was posted	on Thursday, December 5th, 2013 at 6:52 pm. You can follow any responses to this entry through the RSS 2.0 feed. You can leave a response, or trackback from your own site.